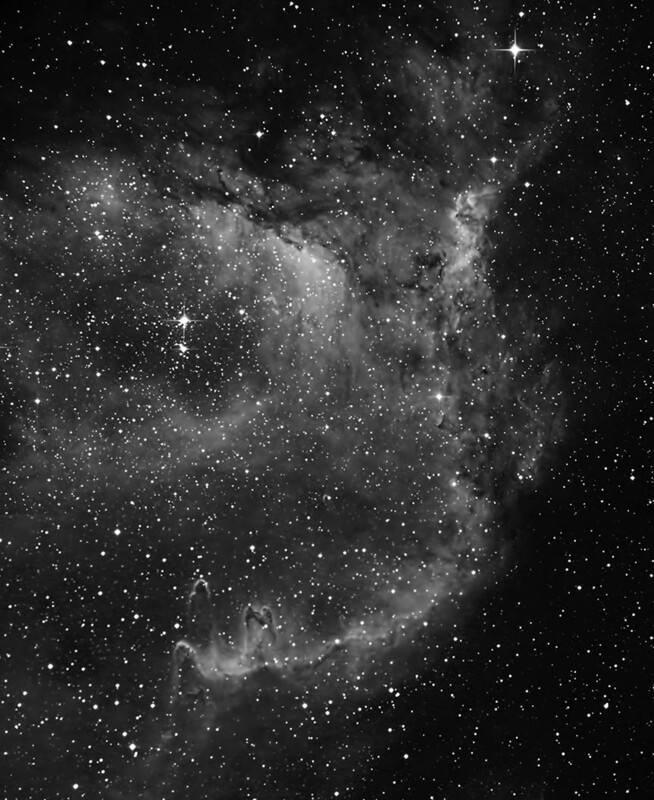 IC 1848 (also designated as Sh2-199, LBN 667, Westhout 5) is commonly known as the Soul Nebula. This is likely due to its proximity to the Heart Nebula. Other common names are the Fetus or Embryo Nebula. It lies 6,500 light years away in the constellation of Cassiopeia. The nebula is a vast (100 light years wide) star-forming region consisting of ionized hydrogen gas and accompanying dark nebula. It contains several open star cluster consisting of very young (i.e., one million-year-old) stars. Images were focused, acquired, aligned, and combined in CCDSoft. The frames were aligned in Registar and combined in Photoshop. The final image was adjusted in Photoshop. Topaz Detail and DeNoise were applied. Taken from my backyard observatory in southeastern Minnesota in October of 2018.